The OXO Good Grips classic tea kettle made out of brushed Stainless is beautifully designed and it also helps that it works like a charm. The kettle boasts of a sleek and modern appearance that can complement any kitchen or living room décor. The tall and imposing of this tea kettle sits regally on the table owing to its unique structural design that consists of a large handle for trouble-free pouring. Lovers of tea will appreciate the features of the OXO classic Tea kettle because they are essential for a balanced flavor extraction of your teas. This whistling tea kettle has a traditional design, which is what adds to the charm and almost reminds one of an image of grandma preparing tea in her kitchen. The kettle has silicon touch points in vital areas of the kettle such as the cap and handle that protect you from heat burns. When you are heating up your water, all you have to do is flip the kettle’s spout cap down and the kettle’s whistle will blow to indicate that the water is ready. Safe and practical, this traditional OXO classic kettle can also be used to serve tea directly at the table as it can act as the perfect centerpiece. This OXO Good Grip kettle is made of brushed stainless steel, which gives it a nice matte finish instead of the traditional shiny metallic exterior. The kettle’s design is picture perfect with no aesthetic flaws that add to the kettle’s practicality and performance. For instance, because of the design, water deposits cannot collect on the kettles nooks and crannies. Thanks to the sealed spout, your water boils in no time and drips are never a concern when using the kettle. The kicker is that the kettle’s elegant design came as a direct result of making the OXO Good Grip kettle safe and easy to utilize. 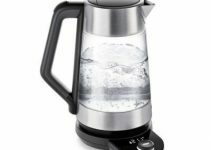 The OXO Good Grip kettle can hold about 1.7 quarts of water, which is actually more than some of the other expensive models currently in the market. Able to boil more than 7 cups of water, this kettle is perfect for a large family. In fact, many consumers that own the kettle have praised and appreciated the kettle’s large capacity. As is the case with all other kettles in the market, caution should be taken when filling the kettle as the water may boil over if the kettle is filled to capacity. The Oxo Good Grip classic kettle has a handle designed to add more functionality, as well as to keep you safe. The kettle has a comfortable base handle that is made from silicon. It also has a cool touch spout cover. The knob located on the lid is also resistant to heat and easy to operate. The kettle boils water efficiently and quickly while the whistle notifies you when the job is done. The brushed stainless steel exterior has a matte appearance, which implies that it does not leave too many fingerprint marks when it is used. Furthermore, the stainless steel exterior is easy to clean and it can resist rust, which makes it durable. The fold-down handle is ideal and convenient for cabinet storage particularly is your kitchen space is small. It is easy to fill up because the handle moves easily. It is easy to use and pour. The whistle is loud so that you can hear properly when the water is done boiling. OXO is a respected name in the world of kitchenware. The kettle comes with a reliable product guarantee. The inside is not as polished as the outside is and the inside is non-stock. Interested buyers should note that it cannot be used on a magnetic induction range. The OXO stainless steel tea kettle can also not be cleaned in a dishwasher. Aside from being useful when brewing tea, the kettle can also be handy for other cooking tasks that require boiling water from rehydrating dried mushrooms to softening your noodles. If you are looking for a classic tea kettle that has a large capacity and a comparatively narrow spout that ensures that the brewing liquid flows steadily into your cup, then you should look no further than the OXO kettle. Thanks for this reliable review, I would like to know if do you have a review about Ovente electric kettles? I think their kettles are also good as oster’s and hamilton beach. The price is also competitive. But I’m not sure with its durability. I also have in plan to write reviews for other Ovente kettles in future posts. Let us know what kettle you bought and how do you like it! I recently read a review on the Bed, Bath and Beyond website that the metal on the lid flakes off into the water inside. Are you aware of this problem? I didn’t know. It is impossible to know all the problems of a kettle. They never appear all at once. In most of the cases, there are no problems at all. Thank you for sharing this with us. I have put a link in your comment so that others can read about.